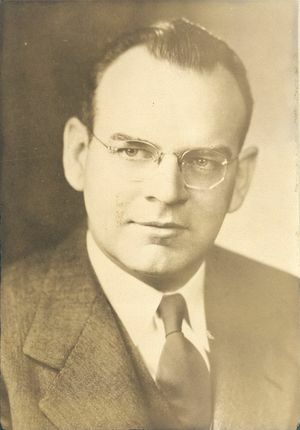 Stuart L. Bailey, IRE President, 1949, was in charge of the laboratory activities at the engineering consulting firm that he co-founded with C. M. Jansky. His research was also a pioneering factor in the study of directional antennas. Stuart Bailey was born 7 October 1905 in Minneapolis, Minnesota. He earned his BS and MS degrees in electrical engineering from the University of Minnesota in 1927 and 1928, respectively. His interest in radio was fostered during these years as he served as both a staff member and chief engineer at radio stations operated by the university. It was also during these years that Bailey met C. M. Jansky, who was one of his instructors. From 1928 to 1930, he was employed as an assistant radio engineer by the US Department of Commerce. He worked on Lighthouse Service in the field and then was sent to Panama to install marine radio beacons. In 1930, Bailey and C. M. Jansky formed the consulting firm of Jansky and Bailey. Bailey was in charge of the laboratory activities of the firm, which initially took place in Jansky’s basement. The pair continued their focus on radio technology, including pioneering work on directional antennas. From 1938 to 1945, Jansky and Bailey constructed and operated the experimental FM station W3XO. During World War II, they built antennas for use by the Army, studied terrain effects on short-range radio signals, and did other military project work. Mr. Bailey served as company president from 1953 to 1959, when the firm merged with Atlantic Research Corporation. Afterward, he continued to have leadership roles in the new organization. He retired in 1970, but continued to serve the company as a consultant. Bailey was a member of Eta Kappa Nu and the National Academy of Engineering. He published several articles in Proceedings. He was IRE president in 1949. He was awarded a Centennial Gold medal from the IEEE in May of 1984 and also previously received an award from his alma mater recognizing his leadership in the communications field. Bailey was married to Carol Sue Bailey. He was known for a dry wit and old-fashioned expressions such as, “you betcha.” He died in Maryland at age 78, on 11 August 1984. This page was last edited on 26 February 2016, at 20:52.